View The Best Tech Deck Scooter Below! What is a Tech Deck scooter? Which is better, Grips&Tricks or Tech Decks? 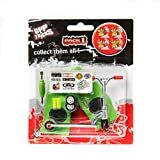 Where to buy Tech Deck scooters? Ever wanted to learn how to skate without having all of the dangers that come with it? Tech decks will be for you then. 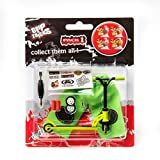 These miniaturized versions of skateboards, bikes, and scooters have been around for quite a while now and are on the verge of coming back into popularity. Fidget spinners have had their time in the sun, we have officially come full circle, we now live in a world of the Tech Deck again, rejoice! Whether you are a returning veteran of this pastime or simply looking to learn from scratch, it’s safe to say that there’s plenty of products out there for you to choose from that all vary in quality. There are various makers to take into account when it comes to the right sort of purchases. In this article, we have compiled a list of some of the best Tech Deck scooters that you’ll find in 2019. We are friends with a lot of fellow Tech Deck enthusiasts — they put us on to some of the best products around, so hopefully, we can repay the favor by helping anyone reading this. Remember, Tech Decks aren’t just for kids! The first Tech Deck in our list here comes to us from Grips&Tricks, a very reputable name in the Tech Deck community. The 5Rider Box comes with 5 Tech Decks in total, complete with ramp and halfpipe. This is the ultimate training ground for anyone trying to hone their skills at home or wherever it may be! No assembly is required in this product which makes it very easy to use and put away. 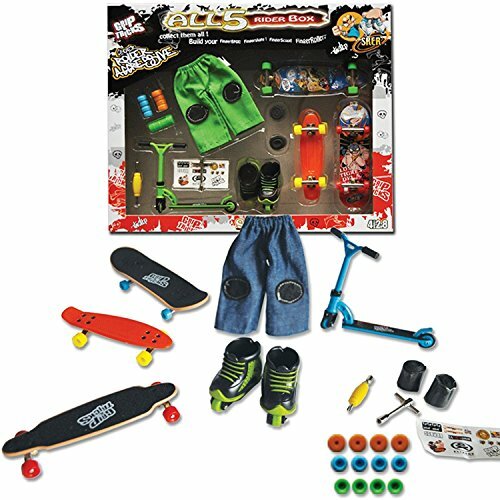 This kit comes with different colored wheels for each of the 5 decks. You’ll also be given a set of mini tools so that you can easily switch these wheels out. We would recommend this product for anyone trying to better their skills, beginners will find this one quite helpful too. Why We Liked It: This set is great value for money simply because of the practice elements that come with it. You’ll be training for hours thanks to the many skills you can perform in this one. The first scooter deck in our list, series 2 of the Envy Scooter line has brought some great Tech Decks to the riders. Made from die-cast metal, this scooter comes with grip tape so that your fingers will very rarely slide around when trying out some tricks or simply riding it. The tape can be found around the grips too which will only add to the traction of your deck as a result. Weighing in at only 59 g, you’ll find that riding this one is a breeze. This one comes with a set of tools which allows you to alter the wheels if you are looking for something different style-wise. 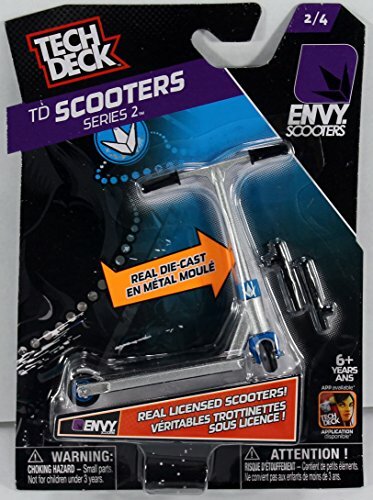 The Envy Scooters from Tech Deck are of great quality, which is what makes them so unique. Why We Liked It – We really enjoyed how responsive this Tech Deck was to use which happens to be one of its greatest strengths. For any budding professional out there, that’s how we’d go about describing the scooter stunt pack 1 to anyone not in-the-know. This pack contains all you need to master the art of Tech Deck. 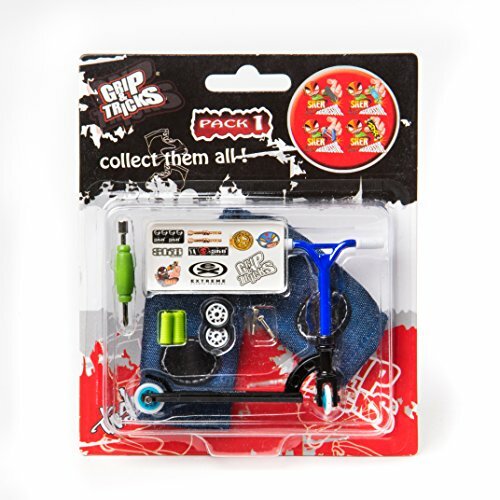 Again this one comes with many different wheel options to choose from as well as all the tools needed in order to adjust other features of your Tech Deck in question. This one comes with a pair of finger pants too, for the added effect of course! This one was quite a comfortable ride too. Most products aren’t as sturdy or as fresh as this one which is arguably its biggest strength. If you consider yourself an intermediate skater, then you’ll find that this one does it for you! Why We Liked It – If you are someone looking to better your skills with a Tech Deck then this should be your first choice. Once you’ve got a hand of the basics, you should then be moving to this one as a gradual progression. There is plenty to be found in this one. Customization is clearly key in this one which is why it comes with stickers and miniature pants to put over your fingers for added effect. The weight of this scooter is quite low, which will only give you a more responsive feel when you ride it. Why We Liked It – If you like customizing your Tech Decks to fit you and your own style, then you’ll find that this one does that and more! The miniature pants really do it for us too! Tech Decks are miniature versions of scooters, bikes, and skateboards that you use with your fingers. Popularized in the 2000s, Tech Deck scooters were considered must-haves in any classroom. One of the main benefits of practicing your skills with a Tech Deck comes via the coordination you will ultimately gain in your hands! These tricks take time to master and require a level of skill in order to perform which partly the reason why people find entertainment in these little guys! It really depends on your personal preferences, to be honest. Although we will state, we found Tech Decks to be a lot better to perform tricks on, whereas Grips&Tricks appear to be more focused on the customizable options that you have at your disposal. We have slightly bigger hands than most, so we found that the better grips on a Tech Deck were better suited for us. Again, this is just a personal preference, meaning you might be of a different opinion if you’ve tried both yourself! Keep in mind that there are other manufacturers to try out also, Tech Decks and Grips&Tricks are just the two that most have heard of. There are various places where you can purchase Tech Decks. The internet is arguably the best place to look as it compiles the list of features that come with them a lot clearer. You can purchase Tech Decks in most toy stores and markets also. If you are looking for the legit items that aren’t bootlegs, then we’d highly recommend you purchase all your Tech Decks online from the actual brand websites/Amazon; gives you peace of mind knowing what you’re getting is the real deal.